Summary: Fibropapillomatosis (FP) is a neoplastic disease that has severely affected Florida's sea turtle population. Current evidence suggests that fibropapillomatosis is caused by an alphaherpesvirus (fibropapillomatosis-associated turtle herpesvirus: FPTHV). However, since FPTHV has not been obtained in pure culture and shown to cause fibropapillomatosis, it is possible that there are other undescribed, co-existing viruses involved in the etiology of FP. This project will use viral metagenomics (viral particle purification and shotgun sequencing) to describe viruses found in fibropapillomas of Florida green sea turtles. Using this method, we have successfully purified viral particles from a fibropapilloma, and discovered a novel sea turtle circovirus that may be involved in FP. Understanding the etiology of fibropapillomatosis is important for the successful management of sea turtle populations. 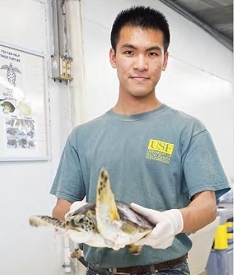 The work proposed here will elucidate the total viral community involved in fibropapillomatosis, and determine if the newly identified sea turtle circovirus is correlated with presence of the disease. In addition, sequencing the complete genome of FPTHV will greatly enhance our understanding of the role of this virus in different stages of fibropapillomatosis. Results: We successfully used viral metagenomics to describe the viral community associated with fibropapillomatosis. This accomplishment is significant because it is the first time that viral metagenomics (viral particle purification and shotgun sequencing) has successfully been performed on animal tissue samples. This led to the discovery of a novel sea turtle tornovirus (STTV1). The single-stranded, circular genome of STTV1 was approximately 1800 nucleotides in length. STTV1 has only weak amino acid level identities (25%) to chicken anemia virus in short regions of its genome, and therefore most likely represents the first member of a novel virus family. A total of 35 healthy turtles and 27 turtles with fibropapillomatosis were tested for STTV1 using PCR, and only 2 turtles severely afflicted with fibropapillomatosis were positive for the sea turtle tornovirus. The affected turtles were systemically infected with STTV1, since STTV1 was found in blood and all major organs. STTV1 exists as a quasispecies, with several genome variants identified in the fibropapilloma of each positive turtle, suggesting rapid evolution of this virus. The STTV1 genome variants were identical over the majority of their genomes but contained a hypervariable region with extensive divergence. Although it is clear that STTV1 is not the causative agent of fibropapillomatosis, it is possible that this virus may affect the susceptibility of turtles to the disease, or the disease progression/outcome. Unfortunately, we were unsuccessful in accomplishing this objective due to methodological limitations. Numerous attempts to purify FPTHV were made throughout the project period, including the development/modification of several different purification protocols. These attempts lead to the important discovery that while FPTHV is consistently present in sea turtles with fibropapillomatosis, the DNA is not present in encapsidated viral particles in the vast majority of cases.